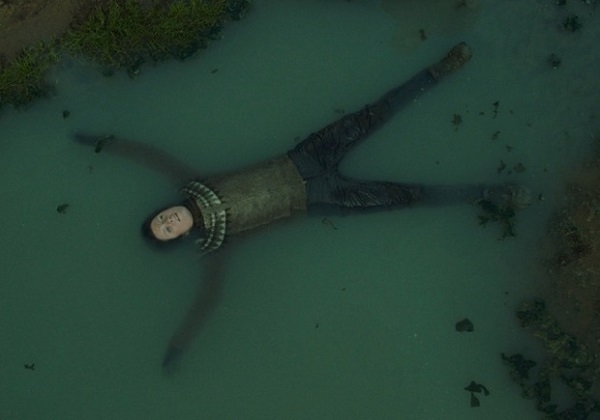 When we first meet Halla (Halldora Geirharosdottir), the titular character of the second feature film from Icelandic director Benedikt Erlingsson, she's single-handedly sabotaging power lines. With just a bow and arrow, a length of metal cable and a pair of dishwashing gloves, Halla shuts down a nearby aluminum refinery–but only temporarily. Accustomed to this form of eco-vandalism, the smelter switches to backup power, and on the news announces that its plans to expand are going forward. Meanwhile, Halla races across the lush, primeval Icelandic landscape, hiding behind lava rock formations or concealing herself in a moss-covered crevasse to avoid being spotted by a police helicopter. Dressed in lopapeysa, the traditional, patterned wool sweater, and leather motorcycle pants, she's a cross between a detective in a Nordic noir and Tomb Raider Lara Croft. Except Halla's actions are accompanied by a soundtrack from an on-screen folksy trio playing upright piano, drum kit, and sousaphone. No one suspects the 50-something-year-old Halla, who directs a small choir and decorates her bright flat with photos of Gandhi and Nelson Mandela, aside from her co-conspirator Baldvin (Jorundur Ragnarsson), a member of the Icelandic government. For instance, in the press the politicians blame terrorists--outsiders interfering in Iceland's industrial progress. But the police's prime suspect continues to be Juan (Juan Camillo), a Spanish-speaking tourist who's just trying to bicycle around the island. The script, written by Erlingsson and Olafur Egill Egilsson, contains many moments of whimsy, which act to reinforce the film' message instead of diverting attention from it. It's a fairy tale, told in three acts, in which the wilderness is at the mercy of the evil in the world; not the source of it. The wild is also what sustains Halla. She draws inspiration by lying flat on the moss and inhaling deeply, and at one point is even revived by a baptism of sorts in a hot spring. She's determined to see her plan, laid out in her Woman of the Mountain manifesto, to its end, despite, or even perhaps because of, a letter from an adoption agency informing her that the application she filled out years ago has now been approved and there's a war orphan waiting for her in the Ukraine. To do the most good, Halla argues with her identical twin (also played by Geirharosdottir), you must sometimes sacrifice what you want most. 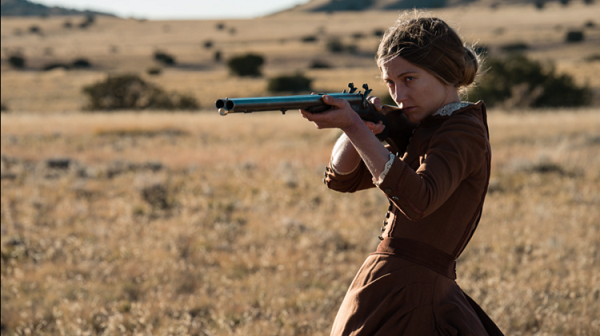 Documentary director Emma Tammi's feature film debut “The Wind” initially seems of a piece with recent female-centered Westerns such as “Meek's Cuttoff” and “The Homesman.” Focusing on German immigrant Lizzy Macklin (Caitlin Gerard), the film quickly draws viewers into the daily challenges facing a female settler attempting to establish a homestead with her devoutly religious husband in the vast and unforgiving landscape of the American West in the late 1800s. Omnipresent is an oppressive sense of isolation, embodied by the ceaseless whisper of the prairie wind. Or is it something more? Is something evil lurking outside in the dark, or is isolated, overwhelmed Lizzy simply unraveling? These are the questions posed as this feminist Western quickly slides into psychological, then literal boogey-man horror, which is, ultimately, the film's undoing. Further muddying the waters is first-time screenwriter Teresa Sutherland's decision to present the story through a series of flashbacks to various moments in Lizzy's prairie existence, including her failed pregnancy and the arrival of another couple—spoiled Emma (Julia Goldani Telles ) and inept husband Gideon (Dylan McTee)—who face their own disastrous pregnancy. Unfortunately, the outcomes of these events are revealed so early that any potential suspense is undermined, and the momentum of what should be Lizzy's slow spiral into paranoia when left alone is repeatedly interrupted. The film tantalizingly suggests potential influences on Lizzy's mental state: postpartum depression, religious zealotry inspired by a pamphlet titled “Demons of the Prairie” (which turns out to be little more than a list of demon names and titles), a romantic rivalry with Emma, gender inequality in the married relationships. Yet none of these are developed beyond brief scenes. The film is at its strongest when it focuses on the real. Early scenes of Lizzy wordlessly performing chores against the backdrop of the Great Plains, as captured by cinematographer Lyn Moncrief, evoke as much about the burdens facing women during America's westward expansion as the cheap jump scares and spookhouse specters that clutter the films final scenes. In a film that initially poses as standard home-invasion horror fare, Jordan Peele's “Us” broadens the social critique that powered his Oscar-winning “Get Out,” to both greater and lesser effect. Representative middle-class nuclear family the Wilsons have headed out to their summer lake home. As they unpack, we are introduced to bespectacled goofball father Gabe (Winston Duke), tightly wound mother Adelaide (Lupita Nyong’o), taciturn teen daughter Zora (Shahadi Wright Joseph) and her grade-school-age brother Jason (Evan Alex), who is partial to wearing a werewolf Halloween mask. After a trip to the beach turns into a game of “keeping up with the Jonseses” with their bougier white counterparts, the Tylers—father Josh (Tim Heidecker), mother Kitty (Elisabeth Moss) and twin daughters Becca and Lindsey (Cali and Noelle Sheldon)—the Wilsons return home for the night, only to be confronted by another family that seeks to usurp their position, this one dressed in blood-red jumpsuits and bearing over-sized gold scissors. The new interlopers are true doppelgangers, but reflected in a perverse funhouse mirror. Played by the same actors, Gabe's double is a rampaging, inarticulate hulk; Zora's duplicate wields a grin as sharp and wicked as the blades in her hand; and the alternate Jason scurries about like a feral creature, his entire head obscured by a nylon hood. Enhanced by cinematographer Mike Gioulakis's (“It Follows”) creeping camera movements and Michael Abels's “Omen”-inspired chanting, the results are terrifying. It turns out that the invaders are led, as are the Wilsons, by a mother-figure, in this case, Addie's duplicate, Red, the only member capable of speech. Asked who they are, Red responds in the labored rasp of the drowning, “We're Americans.” The reply is both inscrutable and shocking. At this point Peele's film both expands its ambition and begins to stumble. If “Get Out” addressed the issue of racial prejudice within the very narrow confines of an upper-class enclave, “Us” seeks to expand that injustice to the entire political and social underclass. As the Wilson's flee their home, they realize that they are not the sole target of the self-described “Tethered.” Their neighbors, the Tylers, are also under assault despite the advantages of swankier digs and a top-of-the-line voice-activated in-house assistant. Television news reports reveal that the activity is not even confined to the area. The problem comes in the delivery. To explain “the Tethered,” Peele's screenplay requires an extended monologue from Red, chockablock with flashbacks and backstory. Multiple twists and turns are involved, and even hough they are portrayed on-screen the audience is really getting it all second-hand, which undercuts the impact. “Get Out” had a bit of the same exposition problem, but Peele managed to work it into the action as a television broadcast. “Us” finds no such solution and ultimately leaves the viewer with more intriguing ideas and images than the movie has time to successfully develop. One lingering practical question remains: If you organized a nationwide revolution, would you arm your troops only with big scissors? And where would you get all those scissors? For his first narrative feature film, director Jeremiah Zagar has adapted Justin Torres’ semiautobiographical debut novel from 2011. Co-written by Zagar and Dan Kitrosser, the script is a sensory-rich celebration of the imagination. Shot in 16mm, the setting—upstate New York in the 1980s—looks both lush and beggared with its acres of wilderness moldering a former mill town; a paradise depressed. Brothers Manny (Isaiah Kristian), Joel (Josiah Gabriel) and Jonah (Evan Rosado) run feral, their parents (Raúl Castillo and Sheila Vand) preoccupied with their own heated, abusive relationship. At 9, Jonah, alone, escapes from the poverty and violence into a narrative that he illustrates in notebooks he hides in the springs under the bed the three brothers share. These drawings cascade across the screen as colored-pencil animations, credited to Mark Samsonovich, providing a more precise point of view than the largely impressionistic inchoate mood that came before, and without which would yield the dulcet emptiness of Terrence Malick’s “The Tree of Life.” The result is a tough yet lyrical coming of age story, leading to a surprisingly sweet sexual awakening. Directed by Jon S. Baird and written by Jeff Pope, “Stan & Ollie” is not your standard biopic. Arriving nearly a century after the formation of the comedy duo Laurel and Hardy, the film certainly is not relying on its subject to draw an audience. Likewise, it eschews the standard career arc rise-and-fall narrative, focusing instead on a brief period in 1953— well after their Hollywood heyday of the 1930s and 40s—when the duo reunited for a series of live appearances in the United Kingdom, in hopes of generating public interest and financing for a new movie. The resulting story is a bittersweet reflection on the complicated nature of artistic collaboration and the ephemeral nature of fame. From the start, the duo are faced with the indignities of faded stardom: half-empty houses in second- and third-tier theaters, cheap hotels, and back-handed compliments (“They're still doing the same old bits”). Yet onstage, the pair effortlessly recreate some of those “bits” with a grace and timing that belie their age. Simply seeing these routines brought to life again evokes a certain nostalgic joy, and one can only hope that viewers unfamiliar with the duo are moved to seek out the original shorts. Yet John C. Reilly and Steve Coogan deliver performances that go well beyond mimicry. Coogan's Laurel is the more strained performance, suggesting complex and shifting emotions with the mere raising of an eyebrow or crossing of a leg. Buried beneath a formidable layer of prosthetics, Reilly captures the gracefulness of Hardy's movements, the daintiness that was always so amusingly antithetical to the big man's imposing girth and bluster. Their interaction and timing off stage is just as deft, like two old friends who know each other so well that each can anticipate the other's actions, resulting in several moments of life imitating art, the line between the two often difficult to discern, even for them. And that ambiguity extends to the duo's famous on-screen bickering, mirrored in real life by a simmering resentment over a brief parting of the ways that occurred years earlier (an event that unfolds in an unnecessary prologue set in 1937). At one point, a real-life argument during a London reception actually generates applause. The wives—diminutive Lucille (Shirley Henderson), Hardy's third wife, and proud Russian-born Ida (Nina Arianda), Laurel's fourth—arrive on the scene, providing humor through their own forceful, mismatched personalities. Still, the focus throughout remains on the artistic marriage of Stan and Ollie, a partnership that weathered decades, wives, and changing tastes. Employing a muted palette reminiscent of sepia, Baird portrays these cultural giants as they face their twilight years surrounded by the signs of a world that is leaving them behind (the sounds of nascent rock and roll; one-sheets for their crass inheritors Abbott & Costello). Ultimately, “Stan & Ollie” looks back fondly, not just on the end of a career, but on the end of an era—when a tie flutter and a bit of soft-shoe could capture the world's heart. The makers of Aquaman's stand-alone debut were faced with a decision: Embrace the inherent ridiculousness of their subject (like Marvel's Iron and “Ant-Man”) or fight the character's cultural stigma by approaching the story and themes with a strong dose of earnestness (like DC's biggest success, “Wonder Woman”). Based on the resulting mish-mash of characters, story lines, and tones that fill this overlong (at nearly 2 1/2 hours) spectacle, the answer was, "All of the above." Read Mike’s review at KCActive. Let's acknowledge, up front, that “Spider-Man: Into the Spider-Verse” is a visual wonder. Combining modern computer-generated animation with 2-D hand-drawn techniques such as action panels, thought bubbles, Ben-Day dots, even the little squiggly lined emanata that indicate “spidey-sense,” directors Bob Persichetti, Peter Ramsey, Rodney Rothman have come darned close to capturing on the big screen the feel of old four-color pulp comics in textures that modern live-action superhero sagas do not. “Green Book” tells the story, "based on real events," of a trip made by Tony "Lip" Vallelonga, an Italian-American bouncer from the Bronx, as driver and bodyguard for classically influenced black jazz pianist Don Shirley on a 1962 tour through America's segregated South, a politically charged topic to say the least. Yet in its eagerness to offer a tonic for our nation's increasingly fraught racial environment, the film tones down its politically charged subject until it's little more than an odd-couple road movie. For his latest release, director Steve McQueen (“Shame,” “12 Years a Slave”) adapted a 1983 British TV crime drama based on a novel by Lynda La Plante, best known for creating the “Prime Suspect” television crime series starring Helen Mirren. McQueen's script, which he wrote with Gillian Flynn (“Gone Girl,” “Sharp Objects”) offers the same star turn for Viola Davis, whose performance as the bereaved Veronica Rawlings could have merited a change in the movie's title from the plural to the singular. Read Beck’s review at KCActive. For his directorial debut actor Paul Dano (“Love & Mercy,” “There Will Be Blood”) took on the challenging task of adapting Richard Ford's 1990 novel of the same name. As could be expected from an attempt to visually represent Ford's endogenous storytelling, the screenplay, which Dano co-wrote with his partner, actor Zoe Kazan (“Ruby Sparks,” “The Big Sick”), doesn't adequately convey the interior of the characters in this domestic drama, making their actions seem overhasty and implausible. For her second feature film, director Marielle Heller (“The Diary of a Teenage Girl”) took over production from writer/director Nicole Holofcener (“Lovely & Amazing,” “Enough Said”), who rewrote Jeff Whitty's script based on Israel's 2008 autobiography. While it's tempting to wonder what Holofcener's version, starring Julianne Moore and Chris O'Dowd, would have been like, irreconcilable "creative differences" with the former conspired to hand Melissa McCarthy a role that's truly worthy of her full dramatic range. But for those with strong stomachs, open minds and a modicum of patience, this new “Suspiria” delivers a shocking, ambitious, and ultimately haunting meditation on female power. Up to now it's been easy to dismiss Chu's movies as puerile fluff. Adapted from Kevin Kwan's bestselling novel by screenwriters Peter Chiarelli and Adele Lim, Crazy Rich Asians is as much escapism as his previous work; it's romantic comedy, after all, and in many ways revels in the rarefied world of the super affluent. Yet, the film manages to expand the spectrum of representation beyond what's been offered to a mass audience before, presenting recognizable folkways to those it represents while also critiquing the ills of its own society. If there's little to dislike in this actively ingratiating Ant-Man sequel, there's not terribly much to recommend it either. Intended as an intermezzo between the heavy courses of Marvel Cinematic Universe tent-pole films, Ant-Man and The Wasp swings so far in the other direction that it risks disappearing in a froth of wackiness.